My name is Kelly Mangan. I’m a member of Rights and Democracy, the chair of the Burlington Progressive Party, a mother of 2, and the wife of an immigrant. I’m not an expert on immigration law or activism— there are a great many people far more knowledgeable than me who’ve spent years working on this important issue. But, as a parent I cannot live with the knowledge that our government is quite literally ripping babies from their mothers’ breasts, and children from their fathers’ arms. Amazingly, people I know (most of them parents, all of them white) have said to me: “But they came here illegally,” as though that were a defense for what is being done to children and parents on our borders right now in our name. We know that many of these families did not, in fact, cross the border illegally, but presented themselves at the border asking for asylum. Still, they were arrested and their children taken away. It doesn’t matter to me if they followed the “proper” procedures to seek asylum to enter the country. 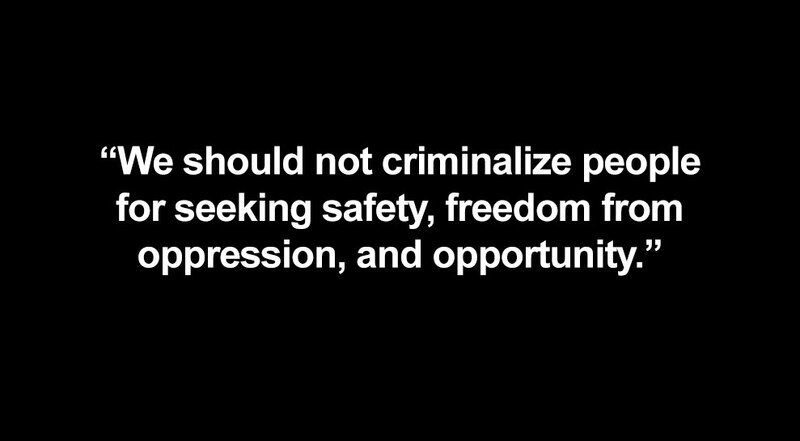 We should not criminalize people for seeking safety, freedom from oppression, and opportunity. Stop for a moment and consider this: What would YOU do to protect your children and give them a better life? Would you walk across a country to save your children? Would you swim across an ocean? Climb a wall? You know you would. Would you REALLY stop a few yards short of safety because of an imaginary line in the sand? Of course not. For those who say “why can’t they just come here legally?” I can tell you that for me and my husband, the process for him becoming a citizen took years, thousands of dollars, letters of recommendation from employers and friends, repeated biometrics and personal interviews (all out of town and for which he had to take time off work) to determine if our relationship was “valid.” This was despite that fact that we were married and had a child. It also required a foot-high stack of forms and legal, financial, and medical documentation. And, we’re the lucky ones! We had vastly fewer roadblocks and a lot more resources than the majority of immigrants to this country. We weren’t better, more deserving people than anyone else. We just had more privilege. “Immigrant” is not a dirty word, and I reject the attempts to make it so—it’s a legal and policy term that represents something very simple—human beings. Immigrants are parents and children, employees and business owners, neighbors, friends, taxpayers, and hard workers. They bring skills, knowledge, talent, and experiences with them that benefits our communities, states, and country. Immigrants make this country a better place. This country is built on immigrants’ labor. Always has been. I’m deeply terrified by the anti-immigrant fervor gripping America right now. Especially a recent remark made by President Trump. He said that our country is “infested” with immigrants. This is not a flippant choice of words. Like most of his rhetoric, it’s is deeply white supremacist, and is aimed at dehumanizing specific groups of people. That’s frightening enough. But what I find particularly terrifying about this most recent comment is the glimmer of intent behind it. How does one resolve an “infestation”? When we allow ourselves to see others as something less than human, that’s when all manner of horrors suddenly become justifiable possibilities. The leap from internment to extermination is very much shorter than I think we’d all care to believe. And for those who call me an alarmist for saying so— who think that such a thing could never happen in America— I would remind you that it’s already happened. Right now in America, children are being ripped from their parents and put in cages. The question each of us must ask ourselves right now is: what are we going to do to stop it? Here, in Vermont, we’ve passed policies that speak to a sentiment of making our state a “sanctuary” to keep us from feeding into the hateful frenzy, and providing aid and comfort to those who are terrorizing people seeking freedom and opportunity. We need to call our elected officials to ensure that Vermont remains a beacon of freedom, and unity, no matter our origin. Call on Sens. Patrick Leahy and Bernie Sanders and Rep. Peter Welch to continue to fight the Trump administration’s egregious policy of separating children from their parents and caging them in warehouses. Call on Gov. Phil Scott to join the growing list of governors who will refuse to send National Guard troops to the borders in support of the Trump administration’s policies. SIGN THE PETITION URGING GOV. 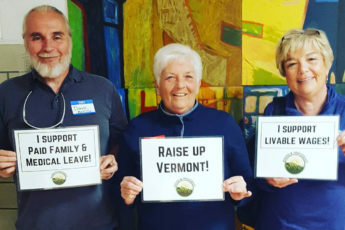 PHIL SCOTT TO KEEP FAMILIES TOGETHER!